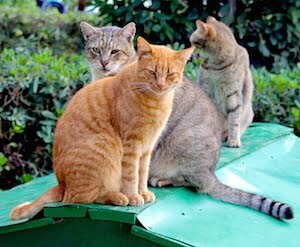 Newsletter #2: Did you know that on Malta and Gozo, a total of approximately 1'000 persons take care of -a conservative estimation- 100'000 feral and abandoned cats? We made the math. Both islands cover a land mass of 316 km² or 122 square miles with a population of 450'000 in our mini-state in 2015. That's 1'424 inhabitants, or 3,16 persons feeding 316 stray and abandoned cats - per square kilometer! In this urban density of one third of the land mass, and the barren landscape surrounded entirely by the Mediterranean Sea, stray and abandoned cats have little chances to survive. Lack of food, water, shelter and the 300'000+ vehicles in the streets (yes, that's true) would make their lives dangerous and short, if not supported by the many volunteers our book will to portray. «Islands of Cats» highlights these men and women, whose vital work keeps the cats healthy and fed in permanent locations, and, most importantly, by neutering and spaying holds the furry population under control.